I first met Kathy Pope in Nov of 2010. After years of living with hair loss I saw her article about helping woman with hair loss and called her. I have been in a hair loss control program for six months, using the latest products and laser treatments and I am thrilled with my results! My hair is fuller and filling in previous hair loss areas. I would recommend her to anyone! She is always there to help and answers any questions without hesitation. 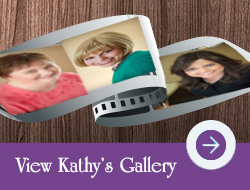 Kathy Pope’s Hair Fashions – When my previous hairstylist retired I didn’t know where I was going to go. I looked in the yellow pages & found Kathy Pope Hair Fashions, that was 9 years ago & I’ve been going to her ever sense. I loved her work the first time I went to her. She is great and I am so happy that I found her. I have been going to Kathy for ten years and I would never go to anyone else! I go once a week and I am always EXTREMELY SATISFIED with the work that she does. I would highly recommend Kathy to women and men of all ages! She knows hair! She is the hardest working hair dresser you will ever find! She cares about her customers and goes above and beyond to do what it takes to help everyone. She uses different techniques to find out what works best for you. Her wigs are the best quality! I can’t say enough good things about Kathy’s products and her work! Kathy is amazing!!!! She has made my life so much easier dealing with my hair problems. Wouldn’t go anywhere else!! I had hair loss due to thyroid removal and was devastated, one day I happened to find Kathy s website and decided to give her a try. Thank god I did. Its only been two months of seeing her and already there is a huge improvement in my hair. She gave me hope on my first visit to her, hope when I thought there was none. She has been a blessing to me, I cannot believe the difference I am already seeing and I cant wait to see the end result. Thank you Kathy!!! Kathy is a skilled stylist and also provides great info on hair care and styling at home. She s a true professional and I can t imagine going to anyone else anymore. My experience with Kathy was exceptional. She made me feel very welcome and relaxed during the free consultation. After my hair restoration, the results were “like a miracle.” Kathy’s expertise is truly amazing. I hope anyone contemplating any type of hair fashion would choose Kathy Pope! This woman has my utmost respect. She is a true hairdresser and cares about her clients. She has helped me when I thought all hope was lost. Due to thyroid cancer my hair started falling out. I had the thyroid removal surgery & became cancer free, but my hair loss was unreal. Between her giving me vitamins & special shampoo & conditioner she has made such a difference. My thanks to Kathy. If you need help she’s the hairdresser, hair loss expert to call, you can trust Kathy Pope. My hair was brittle, dry and getting thin on top. I went on Kathy Pope’s website and decided to give her salon a try. In just six months my hair is much better. Kathy is sweet and friendly….an easy way to spend a little time each month! I first met Kathy Pope in Nov of 2010. After years of\r living with hair loss I saw her article about helping woman with hair loss and called her.\r I have been in a hair loss control program for six months, using the latest products and laser treatments and I am thrilled with my results! My hair is fuller and filling in previous hair loss areas. I would recommend her to anyone! She is always there to help and answers any questions without hesitation. Thank You Kathy for making me feel so good about myself. You gave me back my self esteem. I was down and out when I came to you and you turned my life around. Thanks so Much! When my previous hairstylist retired I didn’t know where I was going to go. I looked in the yellow pages & found Kathy Pope Hair Fashions, that was 9 years ago & I’ve been going to her ever sense. I loved her work the first time I went to her. She is great and I am so happy that I found her. I had Kathy give me extensions after my hair starting thinning and it makes me look so beautiful. Thank you Kathy I love them! I’ll refer my friends anytime. Fill out the form for your free consultation, over the phone or by email if desired.